What’s that smell? Money? How essential oils can help sell your house. Aromatherapy as a marketing tool to sell your house? It’s nothing new. We’ve all heard about how freshly baked cookies create an inviting atmosphere for buyers when selling your home. It’s something that every agent agrees would help entice a buyer to spend more time in the home – and the amount of time potential purchasers spend in a property typically correlates directly to whether or not they submit an offer. The reality is – as you are running around frantically making beds, putting away toys, and turning on all the lights – the last thing you have time for is to bake a fresh batch of chocolate chip treats while still leaving the kitchen spotless. Don’t fret. There are options! I’ve been using Essential Oils in my home for years now. I have experienced lots of positive results from their use first hand. If they work so well in my personal life, it was high time I used them at work too. Now my office has a diffuser going almost all of the time – typically using ROSEMARY as it promotes activity and concentration while reducing fatigue – this keeps my coffee consumption down during the after lunch food coma. So I started thinking about our listings…. There is plenty of science to back up the effects of essential oils – covering many uses including cleaning supplies, bug sprays, health benefits, and more. I googled to ends of the internet writing down which oils were suggested for open houses, keeping a tally of each one mentioned with the goal of finding a top 5 that I could recommend to our clients. However, it was a study by the University of Washington that stopped me in my tracks. What is this simple scent and exactly how much more effective was it? It was the scent of WILD ORANGE and on average, with the citrus smell wafting through the air, buyers spent 20 percent more money, buying more items. I looked over my spreadsheet and noted that in tallying over a dozen different articles – just about every one included either “orange” or “citrus”. Consensus – but wait, there’s more! 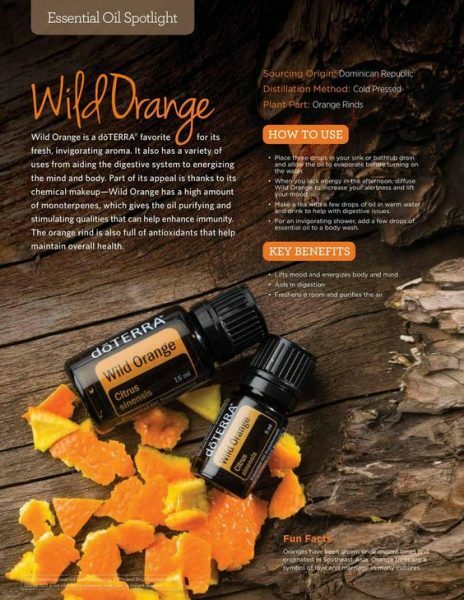 Ask Gina & Company, your Northern Virginia Real Estate experts, is now including WILD ORANGE essential oils as part of our staging and open house packages. Talk about full service – AGC goes the extra mile to raise your bottom line – using all of the tools in our ever expanding toolbox (including this recent post about which color to use to get more money when selling). If you are considering selling your property, call us sooner rather than later, so we can help you get a leg up on the competition and obtain the best possible price for your house in the shortest amount of time.